I have realized that Blogging is a tricky medium. You might be the best of writers but there is no guarantee that your post will be taken in the spirit that it was intended. So far I have written about 550 posts and I say this from experience that all of them have been misunderstood by someone or the other. Once I was being sarcastic, and some people thought I was upset and angry. Once I was sharing travel stories and it some how turned into a religious debate. Once I was being honest, and someone thought I was being arrogant. Once I was being polite, and someone thought I was being a push over. Of course, none of this has stopped me from blogging or speaking my mind. That simply wouldn't change. But I have learnt that no matter how clear and simple I keep the posts there will always be an element of perception and interpretation, which again is subjected to the people who are reading it, their backgrounds, experiences, culture and sometimes their relation to me. I cannot control all this. So I have no option but to continue saying (writing) what I believe in. The only thing which IS in my control is - I can make sure that there is never a personal vendetta or evil intended against anyone. And trust me, there never is! P.S. There is always an option of not reading my blog if you don't like me or disagree with my thoughts. No hard feelings there...! Love the combination of your earrings with that tunic! Goodwill Huntingg: Enter my Shabby Apple dress giveaway! We all have different minds so we understand things differently. It's like reading a book - some might enjoy and rave about it and others might dislike said book for whatever reasons - the same goes for blogging, too. I guess it's always hard for something to be the way you wanted it to be intended when you type. I always say there should be a 'sarcastic font'. Also, I need your shoes in my life. Agree with the above comment.. 'sarcastic font' should solve the problem! Love your statement earrings with the simple kurta..! there z nothing in the world that is appreciated is what we learn frm gita..
love the kuti,pumps,earrings all ya!!! Love that kurti--looks so fresh and crisp! I wouldn't worry about the misinterpretation part(in one ear and out the other.... :)--like you said, your conscience is clean and that is all that matters in the end, right? Enjoyed reading this post. It's insightful. You look so stunning & classy in the kurti top. secondly, with 678 followers*count according to when last checked* you cannot expect all of them to be of the same mind level as you...let's just say for every sarcastic post-thank god a few understood them, for all the honesty, thank god, there was also empathy..and so on! screw the confusions and blame it on ignorance...often there is no harmful intention especially for someone like you who is so super nice on her space with everyone! And the indian look is awesome. You can't please everyone, I'm glad that you keep writing and blogging in spite of those that just don't get your writing sometimes! Love your tunic! You look gorgeous!! Ah, a very clean look Tanvii! You look so chic Tanvi. Those earrings are awesome! Fashion, Art and Other Fancies puts it so well. We all perceive things differently and it's impossible to please everyone. Keep doing what you're doing, I think you are fabulous. The written word is always open to interpretation, you are right. I have come across whiny, bitchy and snobby in my posts as well, but those who can read my sometimes dry sarcasm can relate. I always enjoy reading yours! And, you're right, if they don't like it, they can move on to another blog. I love your tunic. Gorgeous! Those who don't like it don't read it! But those like me who love it want more of it! :) Looking absolutely awesome in the kurta! You are right! People sometimes act according to their experiences for which we can't blame them. 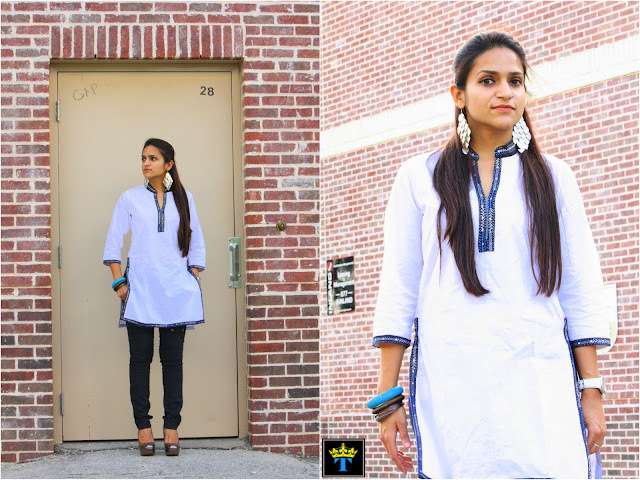 The earrings are so well with the kurta! Every picture on this post is gorgeous...and those earrings!!! And remember the 1st Amendment! there's always going to be someone who misunderstands what you're saying, so just go on saying it. love your outfit! Loved ur interesting anecdote, Tanvi. Yes, we can never please all the people all the time. And a blog is not intended to be so, We write for our happiness without hampering others. Thats all. Nice shoes here, love it! Thats so rightly said Tanvi. Your post reminds me of that game played in corporates and schools. Where a sentence is whispered in your ear and you have th whisper it to your neighbour. And the last person has to say it out loud, and the result is something completely different. Loved this post... as sometimes perceptions of say, confidence can sometime be confused or perceived as arrogance... You look gorgeous lady! I so hear you. It can even be hard when emailing or texting friends. There can be a lot of misinterpretation with those ways of communication. i love this ensemble and keep speaking your mind. And I couldn't agree with you more about the whole being misunderstood thing. I think all bloggers can relate. There is always that ONE PERSON (or five, haha) who really don't read the entire post before making a judgement or who don't understand enough to know what is going on. And yeah, I've noticed you taking a lot of hits thist past year, which I find shocking, since you're one of the sweetest girls in the world. It's weeeeird! I'm sorry you've had to put up with some crap. Lovely pictures, great backdrop for this ensemble. Love the tunic! You look fabulous! Say it sister!!! My thinking is...your blog is just that, YOURS..and you are free to speak your mind and state your opinions:) Guess what? I realized you were not in my blog roll...shame on me!! Fixed that lickety split!!! Enter my Shabby Apple Fab Frock Giveaway!! So true my dear! It boils down to the fact that what you blog should be authentic to you. Love those earrings! Yes - the written word is just the written word. It's tone and inflection that give it weight. On the flip end, as a reader, they read it in their own tone, which depends on their mood. Keep on writing and truckin on sista! I'm the exact same way. 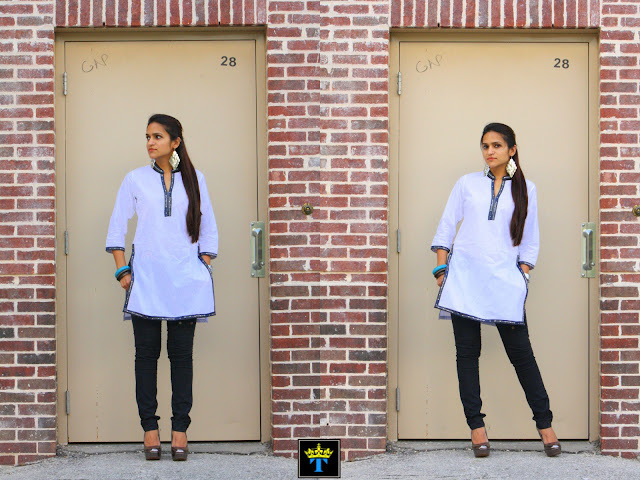 Love your kurta. Happy Diwali to you. hahahaha! Loved your bitchy comment! haha. Seriously now! I have got to tell my hubby that one. I love the shoes and the earrings!! My lovely Tanvi, u know what I like to say?? "100 people- 1000 characters!" U can never know how somebody might take our words... and it doesn't' matter, just write your story!! Those earrings are magnificent! And in all situations there will be people who interpret the things we say differently to how mean mean, you're right to not let it stop you! You look beautiful and amazing. I love your thoughts. People think I'm a pushover sometimes:). Such a shame that people take things in a way that they weren't intended. Communication is a funny thing, say something and everyone will read something different into it. I love your oufit. It looks really fresh and the earrings are fabulous. Super Right..Super Write(ing)!! Perception and Interpretation in written or verbal, so challenging..forget texting/bbming that's another degree of communication/miscommunication! Like the tunic lots! you look pretty..as usual, photos Jhakas! Those are real hot pumps, love them and how they perfectly go with the earrings! It would be impossible to please everybody with what we wear or write, but lucky me I happen to love your blog! I'm automatically drawn to bracelets lately and yours are pretty fab! Keep on doing what you do, lady. You're a breath of fresh air! Oh dear Lord,I've missed white kurtas so much!Your post inspired me to get one in chikankari right after my exams.And about your posts,see,you're older and more experienced than me but I'd like to say something.All these debates,heated discussions,criticisms...don't they kind of indirectly prove your success as a blogger?I mean,c'mon,the best of the writings are those that are dynamic enough to be read by fifty people and still not have less than forty interpretations!The history has seen the best in every business also being the most controversial ones.Isn't it satisfying to see that you say one thing and then find so many new meanings of it?Some of them even might not have come to your mind when you had written the post!That's the beauty of sharing toh. i'm glad that people havent stopped you from speaking your mind--keep strong:D! So glam and the shoes make it all pop. Thanks so much for joining the Monday Mingle. OMG seriously..whatever...you just keep doing what you do :) And I think white looks great our skin tones..so fresh and clean. Gorgeous! You have great style! It's always great to find other fashion bloggers from San Antonio like myself! people really have different interpretations and ideas on the same thing, some people view it as simple others may view it as extraordinary; some thought of it as a very optimistic thing but others have negative feelings about it... that's how magical each individual is and it is truly amazing too how one person appreciate the value, opinion, ideas and talents of others... loved your blog!!! you really are a wonderful person, love you girl!!! kissess!!!! you go, girl! love this look, very chic! You look absolutely beautiful. And like you did it just by breathing. Hello. And yet another post I've stumbled onto this morning that I'm so glad I read. Keep it simple and be ok with somebody not getting it. Got it. And big smiles to you! Oh yes, writing is tricky like that. Yup, right...its tricky that ways when you have such a wide audience tans! Love the to...the earrings are wow!